Florence’s Patience Hall (BDM) and Scott Cochran (SCM) present the $10,000 to Florence’s High School athletic program. 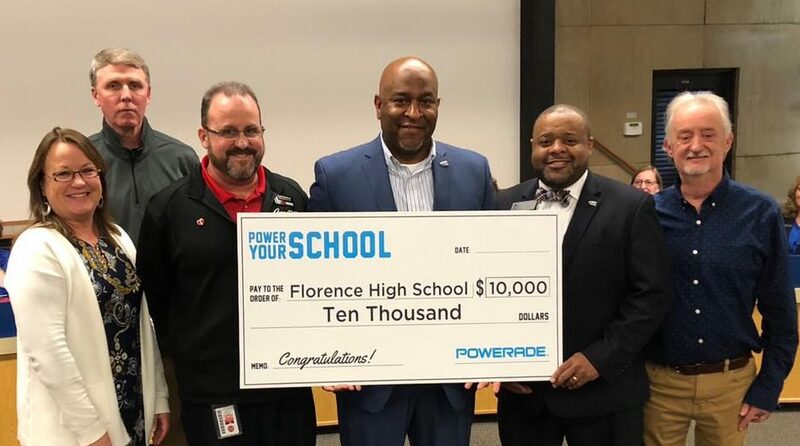 Florence High School in Florence, Alabama was a selected winner of $10,000 from Powerade “Power Your School” program. This program, provided by Powerade™, gives an opportunity for students to craft and submit a video detailing why their program should be awarded one of the various prizes and how they will utilize the prize to enhance programs and opportunities. Over one million dollars are awarded annually through the Powerade “Power Your School” program. Florence High School was the only $10,000 winner in the state of Alabama, and one of 50 nationwide $10,000 winners. The contest also selected 250 winners to receive $2,000. The video Florence High School submitted showcased the boys basketball team and athletic director Bryon Graham says they plan to use the money to help the track program who has needed repairs for several years. Florence Coca Cola’s Business Development Manager Patience Hall played a vital role in helping Florence High School win the contest. She oversees all the schools in the Florence area and made sure they had all necessary information and help in submitting material and sharing the contest. Patience Hall and Florence Sales Center Manager Scott Cochran awarded the school’s athletic program the $10,000 check at a board meeting in March 2019. There is also a Powerade Pep Rally for the entire school planned for April 2019. Congratulations Florence High School!! GO FALCONS!!! !